do it for him – I’d be much better at it. me to you? Your arrogance. This confirmed he was The One. heroic. Neither of us had any doubt. field of stones and stars. faith in the infinite rose. that is even greater than art. This is a minor old poem. I'm posting it only because it continues the thread of "extreme effort" (or call it simply "hard work") as prevention of depression and suicide. The alcoholic mentioned here once made a remark that stayed with me: "Alcohol is always there for me. When I need it, it is there." At the time I couldn’t counter that with a positive example. I couldn’t tell him what else could always be there for him when he needed it. Back then, I was a love junkie more than a poet (excusable at a young age), so I didn't have anything that would be there for me whenever I needed it. But I sensed that the possibility existed. When I was in my late teens, my self-imposed routine of studying English gave me a taste of the strength that comes from working hard and making progress toward a goal. That goal ran out, however, and I didn't yet know that it's the work, not a particular goal, that matters. Only now, this late in life, I can say: "Work is always there for me." Or, to return to the metaphor that I use in the poem, the inner ox is always there for me. And the rose? It's not a goal the way I used to think of a goal. At one time my goal was to publish in one hundred magazines. I'll never forget the empty feeling I experienced when I reached that goal. 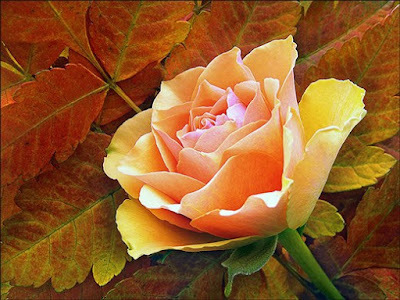 The rose is closer to beauty -- I love to create beauty. 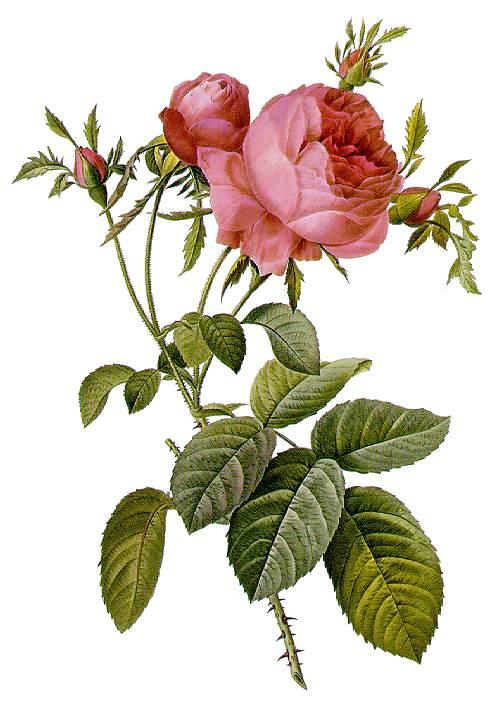 The rose is also a symbol of the soul (a poem that I read for the pure pleasure of it is "one for the rose"). But I don't want to define the rose. Let rosa centifolia have a different meaning for each person. I can imagine someone saying, "So work is now your drug, your addiction?" Not only work; I listen to my favorite music the way other people do drugs. These labels do not bother me. I am never going to seek a "balanced life." I want to do what I love doing, without forcing myself to seek "balance" in some boring activities. I found something that works for me, and I feel enormously lucky. Is there bliss after the inner ox plows for a good long while? Is there pleasure in the plowing, and ecstasy in the aftermath of it, when you're all plowed out, so to speak? I remember reading somewhere long ago that the masochist doesn't really enjoy pain (as Freud surmised), but needs pain to break through the blockages to pleasure. That there is so much repression of pleasure in some people that it takes a being struck or pained (physically or emotionally) before they can feel a flow of pleasure in their bodies. Intense effort can be a kind of pain you place on yourself, until you, in effect, break under it. Life should be easier, and pleasure should be a daily experience. When I studied tantra, I recall the teacher saying that all depression is due to lost pleasure. Luckily for us, we get pleasure from good poems. More than catharsis, there is beauty. You've got me thinking about all this. And you have certainly made me think as well. What I said needs a caveat about not going so far that work becomes destructive. And given how compulsive creative people can be, work is an upper and, like speed, it can kill. When I got tired of my depression – a boring state of mind, with thoughts so repetitive that make me think of an endless pantoum – I asked myself about the last significant stretch of time when I was not depressed. I had the answer instantly: when I was both writing articles and teaching at a junior college. I was simply too busy to be depressed. So the answer stared at me with such clarity that I practically felt my neural networks remodeling. And I was right. It became impossible for me to indulge in depression again (my depression was largely volitional; I could get depressed at will; I know I'm not the only such case). For me creative work provides enough pleasure so that it's rare that I feel de-energized by it; yes, there is pleasure in the steady plowing. But now and then it gets to be too much, with too many demands from all directions. Then the best thing for me is to drop everything, lie down and decide which activity should have priority. And even after I've decided, not to rush to it immediately, but close my eyes and do my parasympathetic breathing (the long exhale). And then to remember to work slowly and take breaks. To do anything not in a manic fashion, but with slowness and serenity (at least as an ideal). To plod, rather than frantically thrash and hurry. Done serenely, the plodding/ploughing becomes pleasurable, and it's a reliable, sustaining pleasure that's "always there for you." As Hopkins says in "The Windhover," "sheer plod make plough down sillion / Shine." Let me say it again, because I feel I haven't emphasized it enough, since I'm only learning -- that work should be plodding, serene, and not manic and dangerous to health. The terrific success of books such as Scott Peck's The Road Less Traveled, with their emphasis on self-discipline and delayed gratification, can blind us to the obvious danger: the potential development of anhedonia, the unwillingness and/or inability to feel pleasure. As long as music and the beauty of nature give me instant pleasure, I feel I am all right. But I remember the times when I had to force myself to listen to music or take a walk; those were also the times when I worked with an anxious feeling, a feeling of failure, rather than in a more pleasurable "plodding" way. But I realize I am blessed; all who have creative work are blessed. Why some of us take on so much responsibility and drive ourselves so hard continues to puzzle me. There are people who don't have that ox going in them. A cure for depression--be 100% in the present moment. Over-working is one way to be 100% in the present. In that regard, over-work is self-medication, why you weren't depressed when you were working so hard, I believe. We don't really understand why some people "don't have the ox in them." I don't think it's laziness; more likely it's not having a goal, a direction -- but that's a guess. Persistence is a genetic trait that can be enhanced through the right experiences. The interaction of genes with environment may be too complex for us to ever completely understand all human behavior. I have definitely been saved by the ox in me -- and by having grown up around people who'd survived huge traumas and catastrophes, people who'd been there with Job on the dung hill. The view from the dung hill is different; for one thing, you see a lot of heroism, which makes the impulse to kill yourself over a man seem not only idiotic, but shameful, and a disgrace to my family. Maybe that was a delusion, but it served. I survived my youth. I've learned much about depression (reflecting now on one of your comments), that depth I now call a friend (on some days), a relationship he apparently isn't comfortable with since he doesn't now visit in the same way. He's more devious, stays too long, shape-shifts easily. Still, I call his name, he's in my house, and I demand he lives by my rules. I say, Beware the ox! Unless you can leave room for other, better oxen. The psyche is on the move in the sorry voice of depression and will not be denied, even by an ox. What does it call for? I trust my ox, a wonderful animal that has been my salvation. I used to think that my depressive cogitations were profound, but eventually I saw the repetitive, self-absorbed, and rather pathetic nature of these various thoughts of self-loathing, trying to discover which tragic mistake was the original tragic mistake that gave rise to all the other tragic mistakes, and so on. I was like the hyper-rational mole in Kafka’s “The Burrow.” I say, Beware the depressed mole! He steals your life away from you. Not of the healthy, hard-working mole, however. Below is an elegy (or call it a eulogy) for a Carpathian mole. the softness would be endless. And don't forget the rose. Beauty is a great source of happiness for me. Speaking about the (shockingly recent) turning point in my life when I decided not to be depressed, at that moment I experienced exuberant self-confidence in the strength of my will. I suspect that confidence was due in part to my long experience in keeping promises to myself, and in part to my knowledge that I was descended from and brought up by two very strong women, my mother and my grandmother, and I had their genes and their heroic example. I did not doubt that the power of my will was greater than the power of my wounds. But in the first few days, I also experienced some doubts. Could depression really be ended without drugs and therapy? I did not backslide, but I felt a bit shaky. Yet ultimately I knew it could be done -- not only because intuitively I felt a great light within me, but also because that moment took a lot of preparation. Revelation feels instant, but it often takes a long period of ripening, of accumulating influences. For one thing, I knew that intense activity in the left prefrontal cortex could override signals from dysfunctional, over-reactive and overactive amygdala (what I call "the screaming limbic system" -- the old wounds). This meant that intense, focused left-brain activity, such as learning how to speak a new language, play an instrument, use a new software, or even just preparing a lecture could shut up the dysfunctional deeper structures. Yes, the wounds of the past were real, but dwelling on them was dysfunctional. Forgiveness exercises brought mixed effects: in one case the effect was spectacular, the trauma erased; in another, the memories kept returning, causing crying fits. Amazingly, what finally worked was the commonplace if belated insight that there was only so much time left, and that if I spent that time suffering and crying, I would lose it all -- give victory to both the trauma-causer and my Anti-Self, and end up with a feeling that I have wasted my life. I also knew that cognitive therapy had proved successful in the treatment of depression. Even earlier, in The Road Less Traveled, Scott Peck put forth his view, heretical at the time, that psychological disorders were disorders of thinking. A "mental disorder" was basically a thought disorder -- paying attention to the wrong things, along with an even broader cognitive dysfunction. For instance, Peck said those who were obsessive-compulsive had trouble seeing the larger picture. In depression, I felt, the thinking disorder was more complicated due to memory distortion. The larger picture was absent, but so were positive memories; there was tremendous self-absorption (or call it masochistic narcissism); the slightest negative thought produced a cascade of automatic negative thoughts that kept going on and on. But experience showed me that tight focus on a project and dedicated work could end this whole syndrome like a miracle. Theories such as Peck's are important steps even if they are oversimplified. I discovered that something else was very helpful, and possibly essential in the long run: the "live!" signal from others. Luckily, those around me appreciated what I could contribute as a dedicated teacher, for example. A small but significant group of people kept saying how much they loved my poems. This too was very healing. I know I owe my healing not only to myself, but to supportive friends. And to invisible friends -- the writers and poets who've shaped my mentality and created in me the trust that life could be worth living.